I love making little goody bags or treats for my Workshop attendees. Almost every month at class I have something to show them how much I love them. It makes our gatherings seem like a party! Here they are all together. This month's idea came from the Sale-A-Bration brochure, page 9. I used my FREE Lots of Lavender stamp set (I purchased $50 and chose it from the brochure). When YOU buy the products to make this project (see list) you will spend enough to qualify for a FREE Sale-A-Bration item-like the Lots of Lavender stamp set on page 8!! Lots of Lavender Stamp set: FREE with purchase of above list! 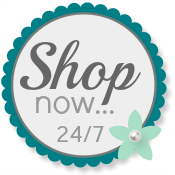 I invite you to choose me as your demonstrator and use my Online Store to order your very own Stampin' Up! supplies.